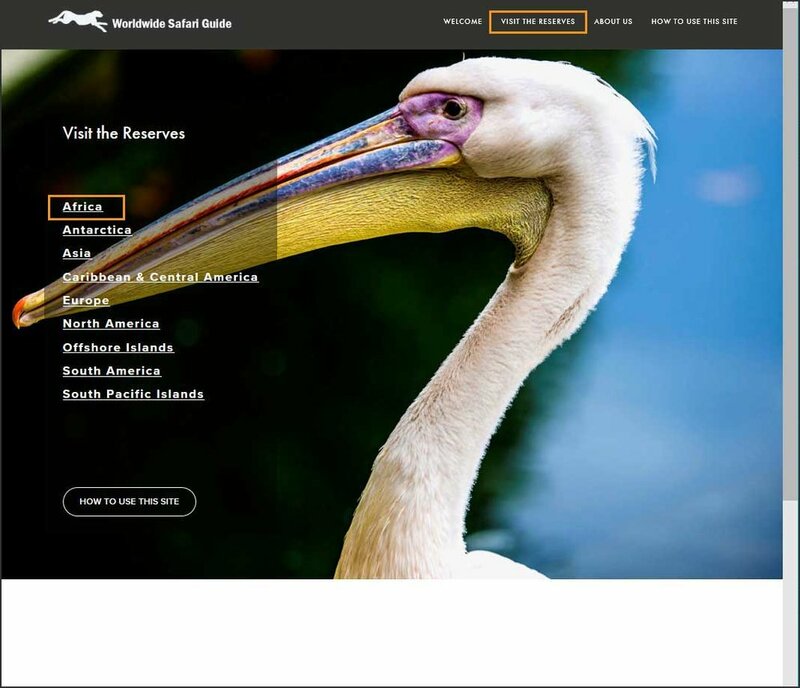 The Worldwide Safari Guide site is designed to allow you to easily access information about wildlife reserves throughout the world. The site is fully accessible by desktop, smart-phone or tablet devices. The navigational section of the site is arranged by continent, country and then reserve. For example, if you want to learn more about the reserves of Africa, you will select the link at the top of the site "Visit the Reserves" then select the "Africa" link on the left (see graphic examples below) . If you want to learn more about the reserves of say, Botswana, link down one level to the "Botswana" page. The reserves in the country of Botswana will be listed below the title. Major Reserves will be shown in all "caps". Minor Reserves are listed in "lower case" letters and sometimes included on the same page as a Major Reserve, depending on the size of the reserve. A "Globe Map" - shows where in the world this area is located. A "Graphic Map" of the Country - showing the location of reserves in that country, with main cities marked, for orientation. A live GoogleMap® - showing a live, scale-able map of the region you are studying, with all the reserves in that region marked. Average Yearly Temperatures and Rainfall amounts (charted by month). More About the Reserves in Botswana - button links lead you outside of our site, to information in greater depth about the reserves in this area. Often you can follow other links within these to get even more information. Advertisements for in-country reserves are hosted as additional information. Then, if you want to learn more about a specific reserve in Botswana, as "Chobe", link down one further level to the page having to do with that reserve. Visit TripAdvisor® - An important additional feature of the site is that each reserve displays a link to visit www.tripadvisor.com. There you can find more information about flights and where to stay in order to plan a trip to the reserve. It will automatically drop you in to the TripAdvisor page dealing with the reserve you have been studying on the World Wildlife Guide site. Photographs within the text content of the site contain in-bedded information about the photograph. To access that information, mouse over or click on the photograph. When you are ready to look for another area in the site, use the navigation buttons at the top of the page to go one level up in the same country "Select Another Region - Africa", or to visit different country "Select Another Region - Global". In most cases, there also is additional information about local and regional conservation organizations active in specific areas. This information is shown at the country and reserve level by banners identifying these organizations. Again, to take Botswana and Chobe as an example, you will see banners for several conservation organizations active in the region. Clicking any of these banners will take you to that conservation group’s website. If you already have a reserve or specific term in mind that you would like to find, use the "Search Box" at the top of each page to find multiple mentions of that topic anywhere in the site. The following additional information will prove helpful to those wishing to travel to see these places for themselves. Clothing—go equipped to dress in comfortable layers which can be added to or taken off as temperatures dictate. Light cotton long-sleeved shirts and ankle-length pants in fabric that can be washed and dried overnight work best, offering protection from sun and stinging insects, and sleeves and pants can be rolled up as desired. Long underwear in light silk can be useful anywhere. So can a wool sweater, light windbreaker, comfortable walking shoes, and lightweight hiking boots. ALWAYS take a wide-brimmed hat; sunglasses; sun block and sun lotion; insect repellent; waterproof jacket; flashlight; alarm clock; in cool climates, gloves; an aluminum roll-up bed-covering can be a life-saver; and if photographing non-digital, plenty of film; if using digital, be sure to check in advance on availability of electrical recharge facilities. Also useful will be plastic bags (for wet laundry, to protect film and cameras in wet or dusty conditions, and big ones can be a makeshift poncho); binoculars; possibly a spotting telescope; collapsible walking stick (some can double as photographic monopods); and first aid equipment such as aspirins, antihistamines, bandaids, ace bandage, diarrhea controls such as Immodium or Lomotil, antiseptic liquid or lotion, scissors and tweezers (these must be checked in baggage), and perhaps others such as water purification pills and antibiotic medication or lotions, on which your physician can advise. Snacks such as peanuts or nutribars can seem heaven-sent when it’s a long time between meals. Some reserves are far off the beaten track where civilization’s amenities are few and far between so it never hurts to pack a roll of toilet paper. Inquire ahead about climate at destination. Three sites which we have found helpful are WorldClimate.com, Weatherbase.com, and BBC World Weather. The temperature and rainfall graphs show data from the gateway cities. Since topography and other local geographic differences can cause microclimates that differ from surrounding areas, it is well also to check local weather in advance with reserve personnel. While checking, inquire also about reserve hours and admission rules—some charge admission, some don’t. Be aware that chances of seeing wildlife are best in early morning and late afternoon, when they are out foraging. Spend time quietly walking, if permitted—many reserves have trails. Wear inconspicuous clothing, no perfume. Stop frequently to let your eyes adjust to the environment. If you are absolutely still, you can better detect wildlife movement and be less detectable yourself. Try to background yourself on what you are likely to see by advance reading (see Bibliography) or by studying brochures available from many reserves. Bring along material to help identify the wildlife. It’s more interesting that way. A competent guide can make the difference between a good trip and a disappointing one. Choose carefully, well in advance, and with recommendations from others. A good guide is linguistically fluent and experienced in the territory. Go over detailed plans carefully before starting out, making sure he/she understands your special interests and how fast or slowly you want to go. In many countries, international driving permits are required. Many parks and reserves require permits for entry—best inquire ahead on current rules. Inquire ahead about and get appropriate immunization for malaria, tetanus, yellow fever, cholera, typhoid, or whatever local maladies might be a problem. The Center for Disease Control (CDC) in Atlanta, Georgia, can advise on medical protection needed and current conditions around the world, with a hotline for international travelers at 1-877-FYI-TRIP (1-877-394-8747), Fax: 1-888-cdc-fax (1-888-232-3299), or via CDC’s Website: www.cdc.gov. Medical insurance companies should be consulted on whether policies apply overseas and cover emergencies such as medical evacuation without purchase of special insurance plans. A helpful organization is IAMAT, or International Association for Medical Assistance to Travelers. For a nominal voluntary fee, IAMAT will send a handy directory of recommended English-speaking physicians around the world, as well as informative booklets on this subject. Contact them at 417 Center Street, Lewiston, NY 14092, Website: www.iamat.org, E-mail: info@iamat.org. Avoid traveling on public holidays. Inquire about local holidays that could present a problem—seasonal or religious festivals, for example, when travel can grind to a halt. Make reservations for lodging and transport well ahead and re-check shortly beforehand. If it’s a remote place and you’re driving, be sure to take plenty of water and check vehicle for tools, spare tire, emergency fuel. Spring and fall are usually best for seeing wildlife in temperate zones. (Remember, seasons are reversed in northern and southern hemispheres.) Another determining factor is rainy or dry season. End of dry season can be particularly good, when wildlife are attracted to scarce water-holes. See graphs for weather information in text, and also inquire ahead—temperatures and precipitation can vary greatly from year to year. Take photocopies of such essentials as passports, visas, drivers’ licenses, and credit cards, in case of loss or theft. Loss or theft of these should be reported immediately to local police and home embassy or consulate. U.S. citizens may refer to a State Department pamphlet, “A Safe Trip Abroad” and “Medical Information for Americans Traveling Abroad,” available by mail from Documents Superintendent, U.S. Government Printing Office, Washington, DC 20402, via Internet at www.access.gpo.gov/su_docs, or via Bureau of Consular Affairs home page at http://travel.state.gov or autoFax: 202/647-3000. Helpful consular information sheets are available from the U.S. State Department for almost every travel destination. Many other countries have these also. Travelers should be aware that among credit cards, American Express offers special protection against fraud or other failure in distant places, including expenses for guides, souvenir purchases and all travel expenses—many others do not guarantee this. Read the small print. Remember, if you like wildlife, be a good wildlife citizen when visiting a reserve. Do not crowd the wildlife or take part in motorized pursuit of animals to take pictures or observe them too closely. This can be as deadly for them as pursuit by weapons, resulting in wildlife injury or death from a variety of causes, including exhaustion, stress, and inability to hunt effectively for food for themselves as well as young families. Don’t approach birds’ nests closely. Human presence can keep birds away from nests long enough for eggs or young to be fatally chilled or overheated, and human scent can attract predators to a nest site. In marine reserves, don’t allow guides to anchor boats in coral formations. Don’t buy or take souvenirs made from animal parts ranging from shells and coral jewelry to skins and feathers, or patronize local restaurants which serve food made with animals taken from wild populations. Do not leave, or allow guides to leave behind, litter and garbage. Support international wildlife organizations such as World Wildlife Fund (generally called here by the name of its international affiliate—World Wild Fund for Nature), Wildlife Conservation Society and Conservation International—see Acknowledgments for web addresses of these and other conservation organizations. Finally, for us, visiting these great reserves around the world has meant recreation in the most literal sense of that word—our lives have been renewed by the experience; we wish that for you as well.